ESL revealed the group drawing for the 16 Counter-Strike: Global Offensive teams competing at the ESL Pro League Season 8 finals in Odense.  The groups for the #ESLProLeague Finals in Odense are in! Which six teams will make it through to the playoffs? In group A is Astralis, HellRaisers, Team Liquid, Vici Gaming, G2 Esports, BIG Esports, INTZ Esports, and Renegades. 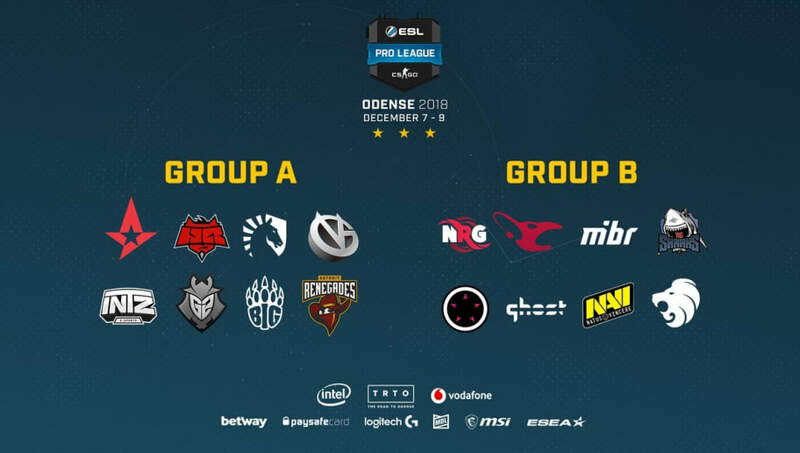 Group B consists of NRG Esports, mousesports, MIBR, Ghost Gaming, Natus Vincere, Sharks Esports, North, and ORDER. The last time ESL Pro League was in Odense was for the Season 6 finals. ​CS:GO teams began competing in online matches Oct. 2 to potentially get a spot in the ESL Pro League Season 8 finals. The group stage will begin Dec. 4-6 and will be played in front of a live audience ​for the first time. The playoffs will run Dec. 7-9.